Ready to deck the halls? When it comes to the holidays, it can be easy to adorn your home in every string of lights and wreath you can find. However, there are some key things to keep in mind when maintaining seasonal curb appeal for the holidays. And if your home is on the market, then you don’t want to be off-putting with your decorations. Though, just because you’re not going overboard doesn’t mean you should avoid holiday decorations altogether. Here are five tips to keep in mind when maintaining seasonal curb appeal during the holidays. 1. Keep decorations to a minimum. One of the most important rules to staging your home is to declutter, declutter. This of course applies to your seasonal curb appeal, too. Don’t crowd your lawns with lights, figurines, large inflatables, etc. Keep your decorations to a minimum so that buyers can envision themselves owning your home and not all of your holiday clutter. Don’t blind your neighbors or potential buyers with your light display. Whether you add lights to your front door and walkways or atop your azalea bushes, the key is to use lights tastefully and sparingly when considering seasonal curb appeal. Keep it classy by using only white lights instead of the multi-colored bulbs or the projection laser lights. You might even add candles in your windows to add a warm glow to your home and to truly evoke a nostalgic feel. In the past, you might have adorned your lawns with inflatable santas and a giant snow globe, but if you’re selling this season, it’s best to steer clear of these. If you’re putting your home on the market or want to maintain classy curb appeal in general, avoid any distracting or flashy decor items. You want buyers to see your home, not the 12-foot Santa. 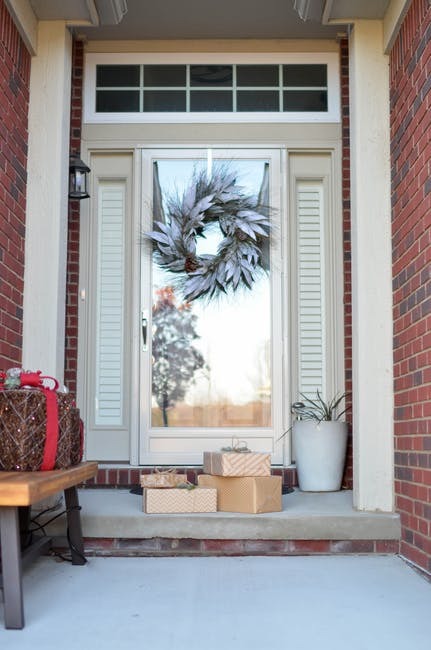 Wreaths instantly make your home more inviting and amp up your seasonal curb appeal with little effort. Instead of a standard spruce wreath, try including a variety of greenery in your wreath from eucalyptus to juniper or boxwood. You might even add berries or pinecones to add more personality, yet keep it chic and uniform. 5. Wreaths don’t have to stand on their own. Don’t think that your wreaths have to stand alone. Create a lovely vignette in your entryway by adding standing lanterns filled with lights or mini trees on the steps of your porch to frame the doorway.